Mobile and social game company Kabam has released Blast Zone on iOS devices. The action adventure game revolves around the fictional Blast Zone television program, and sees players becoming a star contestant, challenged with being the last player standing across both single-player and multiplayer gameplay. 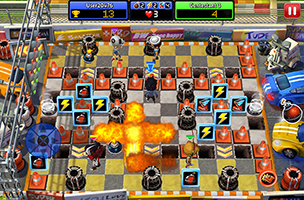 Blast Zone sees gamers battling against their opponents on a grid of squares, power-ups and bombs. Users place bombs to eliminate their opponents or obstacles on the path, and can collect power-ups to increase their movement speed, increase the range of a bomb’s explosion, and more. Each area of the single-player campaign can be played multiple times, and comes with different objectives. Users spend energy to access battles, and move their character around the battlefield using a virtual d-pad. Players complete Blast Zone challenges with a customizable avatar, which can be upgraded with new clothing items. These clothing and equipment pieces can themselves be upgraded, adding a chance to receive free power-ups during battle, as an example. The game’s multiplayer functionality offers six player Free-for-All, Team Deathmatch modes and more. Blast Zone is available to download for free on iOS. Check back soon to follow the game on AppData, our tracking platform for mobile and social apps and developers.